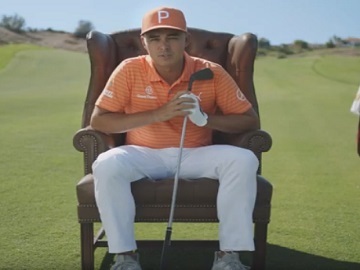 Professional golfer Rickie Fowler shares his steps on how he prepares for a tournament in a new commercial for Farmers Insurance. Titled “Rickie’s Guide to Getting Tournament-Ready,” the ad features Rickie talking about the things he does to get tournament-ready and actually doing those things, even if some of them are quite strange. Thus, he is seen inside a ball that’s being rolled down a hill as part of his process of preparing mentally, pulling a golf chart as part of his process of getting in shape, practicing while someone throws water and ice at him as part of his process of preparing for the unexpected, and practicing literally every shot by hitting a ball that sits on all kinds of objects, from a bird’s nest, to a cone, to a jelly, and a guy’s foot. “When you prepare for everything, you know how to handle almost anything” an onscreen line reads at the end of the commercial. This is not the first time Fowler starred in ads for the insurance company. In previous spots, released in the past years, he traveled back in time to compete against his younger self, give himself some putting pointers, and potentially disrupt the entire space-time continuum. He also showed young Rickie how, with proper technique, hips can generate powerful drives and also that they can generate powerful dance moves.